A Contribution of the Ozarks Regional Herbarium, Department of Biology, Missouri State University, Springfield, Missouri, 65897. During the thirty-seven years since the publication of Steyermark's Flora of Missouri (1963), botanists have continued the process of documenting the number and range of plant taxa in Missouri. As an outlet for this new information, Missouriensis, the Journal of the Missouri Native Plant Society, commenced publication of a Botanical Record section in 1981 with Wallace Weber as editor. Associate editors have included Doug Ladd, Jay Reveill, Jon Rebman and William Corcoran. In 1990 the publication of the Catalogue of the Flora of Missouri (Yatskievych and Turner, 1990) updated nomenclature and documented over 100 new taxa for Missouri. Publication of Steyermark's Flora of Missouri, Volume 1 (Yatskievych, 1999) made further changes in nomenclature and addition of new taxa. This Atlas of Missouri Vascular Plants incorporates all the changes included in these previous publications as well as new taxa and county records published by Henderson (1980) and Mühlenbach (1979, 1983). This Atlas includes 3384 taxa and over 13,039 new county records. New taxa for the state have the literature citation listed in parentheses after each name. These sources are listed in Literature Cited and General References (see below). The nomenclature of each taxon follows, with one or two exceptions, Yatskievych & Turner (1990) and Yatskievych (1999). Counties are not listed for a few taxa because the literature sources did not indicate a county location. Many names used in Steyermark (1963) have subsequently been placed in synonymy. When available, these synonyms are listed with each record. Most of these entries may be considered as acceptable synonyms. However, a few were simply names misapplied by Steyermark and are indicated by the statement "sensu Steyermark, 1963". For reference purposes only, excluded species are listed. Dr. Weber had asked several people to aid in the proofreading of the county records. We are not sure who all of these persons were or what parts they examined. Rather than risk listing some but not all, we simply wish to acknowledge and thank them for their help. The authors ask the general public to continuously proof-read this atlas and to inform us of any errors. Finally, Dr. Weber's untimely death made it necessary to complete this atlas without his valuable help. Indeed, he had planned to complete, as one of the first tasks after his retirement, this atlas. We are sure that one of his objectives would have been to include all new distribution records for Missouri that have appeared in the literature (Corcoran & Weber, 1991). Consequently, this Atlas includes data from the Botanical Record 15 (1992), the new Steyermark's Flora of Missouri, Volume 1 by George Yatskievych (1999) and reports published in Missouriensis and elsewhere. We thank Dr. George Yatskievych for his assistance in identifying the county localities for many taxa. Barkley, T. M. 1980. Taxonomic notes on Senecio tomentosus and its allies (Asteraceae). Brittonia 32: 291-308. Benson, L. 1982. The Cacti of the United States and Canada. Stanford Univ. Press, Stanford, California. xi, 1044 pp. Carter, R. and C. T. Bryson. 1991. A report of Cyperus grayioides and Cyperus retroflexus (Cyperaceae) new to Missouri and notes on other selected Missouri Cyperus. Sida 14: 475-481. Castaner, D. 1982a. Galium divaricatum (Rubiaceae), new to Missouri. Sida 9: 368-369. _____. 1982b. Aira caryophyllacea in the Missouri Ozarks. Castanea 47: 409. _____. 1982c. Two speedwells new to Missouri. Missouriensis 4(2): 49. _____. 1983a. New variety of elderberry. Missouriensis 4(3): 88-90. _____. 1983b. Additions to the flora of Missouri from Europe. Missouriensis 4(4):111 - 112. _____. 1984a. Two additions to the flora of Missouri from Little Bean Marsh. Missouriensis 5(3):106-108. _____. 1984b. An addition to the flora of Missouri found at the Missouri state fairgrounds. Missouriensis 5(4): 130-131. _____. 1988. Missouri Carex notes 4. Carex bicknellii var. opaca in Missouri. Missouriensis 10(1): 13-15. _____ and T. Priesendorf. 1989. Leonurus marrubiastrum L. (Lamiaceae), new to Missouri. Sida 13: 383-384. Christ, A. 1984. Missouri's interesting flora: Myosotis stncta. Missouriensis 5(3): 96-97. _____. 1988a. Arthraxon hispidus. Nature Notes (Webster Groves) 60: 3. _____. 1988b. Vulpia bromoides in Missouri. Missouriensis 9(1): 13-14. Churchill, S. P. 1986. Liliaceae. Pp. 1241-1258 in Great Plains Flora Association, Flora of the Great Plains. Univ. of Kansas Press, Lawrence, Kansas. vii, 1392 pp. Clausen, R. T. 1975. Sedum of North America North of the Mexican Plateau. Cornell Univ. Press, Ithaca, New York. 742 pp. Corcoran, W. T. and W. R. Weber. 1991. The Missouri flora geographic information system and a proposed atlas of vascular plant flora in Missouri. Missouriensis 12(1): 13-20. Conrad, M. L. 1989. Stylisma pickeringii (Torr. ex M. A. Curtis) A. Gray var. pattersonii (Fern. & Schub.) Myint (Convolvulaceae): new to the flora of Missouri. Missouriensis 10(1): 1-3. Couch, R. and E. Nelson. 1986. Myriophyllum spicatum in North America. Pp. 8-18 in L. W. J. Anderson (editor), Proceedings, 1st International Symposium on Water milfoil (Myriophyllum spicatum) and related Haloragaceae Species. Aquatic Plant Management Society, Vicksburg, Mississippi. v. 2230 pp. Cronquist, A. 1952. Compositae. Pp. 323-545 in H. A. Gleason, The New Britton and Brown Illustrated Flora of the Northeastern United States and Adjacent Canada, volume 3. New York Bot. Gard., Bronx, New York. iii, 596 pp. _____. 1980. Vascular Flora of the Southeastern United States. Volume 1. Asteraceae. Univ. of North Carolina Press, Chapel Hill, North Carolina. xv, 261 pp. Crow, G. B. 1978. A taxonomic revision of Sagina (Caryophyllaceae) in North America. Rhodora 80: 1-91. Daoud, H. S. and R. L. Wilbur. 1965. A revision of the North American species of Helianthemum (Cistaceae). Rhodora 67: 63-82, 201-216, 255-312. Denton, M. F. 1978. A taxonomic treatment of the Luzulae group of Cyperus. Contr. Univ. of Michigan Herb. 11: 197-271. Dierker, B. 1992. A new Eryngium for Missouri. Missouriensis 13(1): 25-26. Dierker, W. W. 1983. [miscellaneous state and county records]. Pp. 95-97 in W. R. Weber & D. Ladd (editors), Missouri botanical record. Missouriensis 4(4): 95-98. _____. 1989. A new grass for Missouri. Missouriensis 10(1): 44. _____. and W. L. Wagner. 1988. Systematics of Oenothera section Oenothera subsection Raimannia and subsection Nutantigemma (Onagraceae). Syst. Bot. Monogr. 24: 1-91. Doolen, W. S. 0. 1984. The vascular flora of Big Oak Tree State Park, Mississippi County, Missouri. M.S. thesis, Southern Illinois Univ., Carbondale, Illinois. v, 113 pp. Dunn, D. B. 1982. Problems in "keeping up" with the flora of Missouri. Trans. Missouri Acad. Sci. 16: 95-98. _____. and D. F. Knauer. 1975. Plant introductions by waterfowl to Mingo National Wildlife Refuge, Missouri. Trans. Missouri Acad. Sci. 9: 27-28. Ebinger, J. E. and W. E. McClain. 1991. Naturalized Amur maple (Acer ginnala Maxim.) in Illinois, Nat. Areas J. 11: 170-171. Eckenwalter, J. B. 1977. Systematics of Populus L. (Salicaceae) in southwestern North America with special reference to sect. Aigeiros Duby. Ph.D. dissertation, Univ. of California, Berkeley, California. xi, 331 pp. Ellis, L. S. 1990. Stenotaphrum secundatum (Poaceae) in Stone County, a new grass for Missouri. Missouriensis 11(1): 7-8. Essig, F. B. 1990. The Clematis virginiana (Ranunculaceae) complex in the southeastern United States. Sida 14: 49-68. Faust, W. Z. 1972. A biosystematic study of the Interiores species group of the genus Vernonia (Compositae). Brittonia 24: 363-378. Gastony, G. J. 1988. The Pellaea glabella complex: electrophoretic evidence for the derivations of the agamosporous taxa and a revised taxonomy. Amer. Fern J. 78: 44-67. Gereau, R. B. 1987. Grasses of Missouri: an annotated checklist. Missouriensis 8(2): 49-70. Great Plains Flora Association. 1986. Flora of the Great Plains. Univ. of Kansas Press, Lawrence, Kansas. vii, 1392 pp. Gremaud, G. 1988. Three species new to Missouri. Missouriensis 9(1): 15-17. ______. 2001. Wood lily rediscovered in Missouri. Missouriensis 22: 7-11. Harriman, N. A. 1965. The genus Dentaria (Cruciferae) in eastern North America. Ph.D. dissertation, Vanderbilt Univ., Nashville, Tennessee. vii, 210 pp. Harriman, N. A. 1969. Magnolia tripetala L. and Aralia spinosa L. in St. Louis County, Missouri. Rhodora 71: 478-479. Harris, J. 1998. Another applicant for naturalization in Missouri's Flora. Missouriensis 19: 6-11. Heard, S. B. & J. C, Semple. 1988. The Solidago rigida complex (Compositae: Astereae): a multivariate morphometric analysis and chromosome numbers. Canad. J. Bot. 66: 1800-1807. Heineke, T. B. 1987. Cedar elm in Missouri. Castanea 52(3): 229. Henderson, N. C. 1962. A taxonomic revision of the genus Lycopus (Labiatae). Amer. Midl. Naturalist 68: 95-138. _____. 1980. Additions to the Flora of Missouri. Natural History Note. Missouri Dept. of Conservation, Jefferson City, Missouri. 82 pp. Heumann, B. 1993. Panicum yadkinense Ashe (Poaceae) new to Missouri. Missouriensis 14(1): 23-26. Hooper, E. A. 1997. A new orchid for the state of Missouri: the long-bracted orchid, Coenoglossum viride var. virescens. Missouriensis 18: 9-14. Horn, C. N. 1985. A systematic revision of the genus Heteranthera (sensu lato; Pontederiaceae). Ph.D. dissertation, Univ. of Alabama, University, Alabama. xiv, 260 pp. Hornberger, K. L. 1980. The vascular flora of Roaring River State Park, Barry County, Missouri. M.S. thesis, Southwest Missouri State Univ., Springfield, Missouri. viii, 120 pp. Hudson, S. 1992 Chicken Spike, Sphenoclea zeylanica (Campanulaceae), new to Missouri. Missouriensis 12(2): 50-51. _____. 1994. Three new plants for southeastern Missouri. Missouriensis 15(2): 13-18. _____. 1996. Two introduced species new to Missouri. Missouriensis 17(1, 2): 10-15. _____. 1997. Another new introduction for Missouri. Missouriensis 18: 19-20. Jackson, R. C. 1960. A revision of the genus Iva L. Univ. Kansas Sci. Bull. 41: 793-879. Johnson, G. P. 1988. Revision of Castanea sect. Balanocastanon (Fagaceae). J. Arnold Arbor. 69: 25-49. Johnson, R. 1998. Cyperus difformis, an introduced species new to Missouri. Missouriensis 19: 1-5. Jones, R. L. 1983. A systematic study of Aster section Patentes (Asteraceae). Sida 10: 41-81. Kallhoff, V. & G. Yatskievych. 2001. Revision of the genus Heuchera (Saxifragaceae) in Missouri. Missouriensis 22: 22-20. Key, J. S. 1980. Ivy-leaved speedwell in Missouri. Missouriensis 2(2): 14. _____. 1982. Field Guide to Missouri Ferns. Missouri Dept. of Conservation, Jefferson City, Missouri. 208 pp. _____ and P. L. Redfearn, Jr. 1973. Additions and a deletion to the fern flora of Missouri. Amer. Fern J. 63: 1-2. Kolstad, 0. A. 1986. Cyperaceae. Pp.1059-1113 in Great Plains Flora Association, Flora of the Great Plains. Univ. of Kansas Press, Lawrence, Kansas. vii, 1392 pp. Knox, J. S., M. J. Gutowski, D. C. Marshall & O. G. Rand. 1995. Tests of the genetic basis of character differences between Helenium virginicum and H. autumnale (Asteraceae) using common gardens and transplant studies. Systematic Botany 20: 120-131. Ladd, D. 1983. Sclerochloa dura (L.) Beauv. (Gramineae) in Missouri. Missouriensis 4(3): 73-75. _____. 1990. Noteworthy Collections. 1990. Castanea 55(4): 293. _____., D. G. Gremaud and B. Heumann. 1991. New and noteworthy Missouri vascular plants. Missouriensis 12(2): 36-44. Landolt, B. 1986. Biosystematic investigations in the family of duckweeds (Lemnaceae) (volume 2). The family of Lemnaceae - a monographic study. Volume 1. Veröff. Geobot. Inst. ETH Stiftung Rübel Zürich 71: 1-566. Lane, F. C. 1953. A new color form of Triosteum angustifolium. Rhodora 55: 346-347. Lewis, W. H. & R. L. Oliver. 1965. Realignment of Calystegia and Convolvulus (Convolvulaceae). Ann. Missouri Bot. Gard. 52: 217-222. Mangaly, J. K. 1968. A cytotaxonomic study of the herbaceous species of Smilax: section Coprosmanthus. Rhodora 70: 55-82, 247-273. Marcks, B. G. 1972. Population studies in North American Cyperus section Laxiglumi (Cyperaceae). Ph.D. dissertation, University of Wisconsin, Madison. McGregor, R. L. 1968. The taxonomy of the genus Echinacea (Compositae). Univ. Kansas Sci. Bull. 48: 113-142. _____. 1986. Carduus. Pp. 895-897 in Great Plains Flora Association, Flora of the Great Plains. Univ. of Kansas Press, Lawrence, Kansas. vii, 1392 pp. McKenzie, P. M. 1994. Paspalum bifidum (Poaceae), new to Missouri, with management recommendations for its recovery in the state. Missouriensis 15(2): 19-27. _____. 1995. Aristida desmantha (Poaceae), new to Missouri. Sida 16: 589-590. _____. 1995. Cyperus setigerus and Kyllingia gracillima (Cyperaceae) in Missouri. Missouriensis 17 (1, 2): 24-31. _____. 1998. Panicum verrucosum (Poaceae) new to Missouri. Missouriensis 19: 32-36. _____ and D. Ladd. 1995. Status of Bromus nottawayanus (Poaceae) in Missouri. Missouriensis 16(2): 57-58. Miller, L. W. 1964. A taxonomic study of the species of Acalypha in the United States. Ph.D. dissertation, Purdue Univ., Lafayette, Indiana. x, 200 pp. Mohlenbrock, R. H. & J. Schwegman. 1969. A new species of Carex sect. Bracteosae. Brittonia 21: 77-79. Moldenke, H. N. 1980. A sixth summary of the Verbenaceae, Avicenniaceae, Stilbaceae, Chloanthaceae, Symphoremaceae, Nyctanthaceae, and Eriocaulaceae of the world as to valid taxa, geographic distribution and synonymy. Phytologia Mem. 2:1-629. Morgan, J. T. 1967. A taxonomic study of the genus Boltonia (Asteraceae). Ph.D. dissertation, Univ. of North Carolina, Chapel Hill, North Carolina. iv, 134 pp. Mühlenbach, V. 1979. Contributions to the synanthropic (adventive) flora of the railroads in St. Louis, Missouri, U.S.A. Ann. Missouri Bot. Gard. 66: 1-108. _____. 1983. Supplement to the contributions to the synanthropic (adventive) flora of the railroads in St. Louis, Missouri, U.S.A. Ann. Missouri Bot. Gard. 70: 170-178. Mulligan, G. A. 1980. The genus Cicuta in North America. Canad. Bot. 58: 1755-1767. _____ and D. B. Munro. 1989. Taxonomy of species of North American Stachys (Labiatae) found north of Mexico. Naturaliste Canad. 116: 35-51. Nelson, P. W. 1979a. A new halophyte for Missouri. Castanea 44: 246-247. _____. 1979b. French's [sic] shooting star (Dodecatheon frenchii) revealed in Missouri. Missouriensis 1(1): 7-8. _____. 1982. In Missouri Botanical Record. Missouriensis 4(2): 58-63. Nesom, G. L. and J. T. Kartesz. 2000. Observations on the Ludwigia uraguayensis complex (Onagraceae) in the United States. Castanea 65(2): 123-125. Nightingale, A. 1980. More Alliaria in our area. Missouriensis 1(4): 26. _____ and K. C. Olson. 1984. Veronica anagallis-aquatica L. in Taney County. Missouriensis 5: 136-137. Orzell, S. L. 1983. Natural area inventory and floristic analysis of fens in selected southeastern Missouri counties. M.S. thesis, Southern Illinois Univ., Carbondale Illinois. viii, 205 pp. ______ and B. L. Bridges. 1989. Noteworthy Carex L. (Cyperaceae: section Stellulatae) collections from Missouri. Sida 13: 380-382. Oskins, W. 1981. Who loves a swamp? Missouriensis 3(3): 21-22. Padgett, D. J. and H. Parker . 1998 . Castanea mollissima in southwest Missouri. Missouriensis 19: 37-39. Parks, C. R. and J . W. Hardin. 1963. Yellow erythroniums of the eastern United States. Brittonia 15: 245-259. Pelton, M. 1989. Orchid species new to Missouri. Missouriensis 10(2): 50-51. Rabler, R. K. and J. W. Thieret. 1988 . Comments on the Caryophyllaceae of the southeastern United States. Sida 13: 149-156. Raveill, J. A. & J. H. Belshe. 2001. A northward extension of the known range of Geocarpon minimum. Missouriensis 22: 12-15. Rebman, J. P. 1989. The vascular flora of Piney Creek Wilderness, Barry/Stone Counties, Missouri. M.S. thesis, Southwest Missouri State Univ., Springfield, Missouri. viii, 89 pp., 1 map. Redfearn, P. L. Jr. 1980. Silphium hybrids. Missouriensis 2(2): 15. _____. 1982. New Selaginella species. Missouriensis 3(4): 16-17. Robertson, K. R. 1966. The genus Erythronium (Liliaceae) in Kansas. Ann. Missouri Bot. Gard. 53 :197-204. _____. 1974. The genera of Rosaceae in the southeastern United States. J. Arnold Arbor. 55: 303-401, 611-662. Rogers, C. M. 1963. Yellow flowered species of Linum in eastern North America. Brittonia 15: 97-122. Rosatti, T. J. 1987. The genera of Pontederiaceae in the southeastern United States. J. Arnold Arbor. 68: 35-71. Russell, N. H. 1965. Violets (Viola) of central and eastern United States: an introductory survey. Sida 2: 1-113. Sanders, R. W. 1976. Distributional history and probable ultimate range of Galium pedemontanum (Rubiaceae) in North America. Castanea 41: 73-80. Schuyler, A. E. 1963. A biosystematic study of the Scirpus cyperinus complex. Proc. Acad, Sci. Philadelphia 115: 283-311. _____. 1969. Three new species of Scirpus (Cyperaceae) in the southern United States. Notul. Nat. Acad, Bat, Svi. Philadelphia 423: 1-12. _____. 1970. A new North American aquatic bulrush (Cyperaceae: Scirpus). Notul. Nat. Acad. Nat. Sci. Philadelphia 427: 1-3. Sheviak, C. J. and M. L. Bowles. 1986. The prairie fringed orchids: a pollinator-isolated species pair. Rhodora 88: 267-290. Shinners, L. H. 1965. Ipomoea amnicola (Convolvulaceae), a South American waif in Missouri. Rhodora 67: 200. Small, E. 1978. A numerical and nomenclatural analysis of morphogeographic taxa of Humulus. Syst. Bot. 3: 37-76. Smith, T. 1994. Carya pallida, a new hickory for Missouri. Missouriensis 15(1): 5-7. _____. 1996 . Echinochloa walteri, a new grass for Missouri. Missouriensis 17: (1, 2): 32-35. _____. 1988. Poa interior Rydberg (Poaceae), a new record for Missouri. Missouriensis 9(1): 8-9. _____. 1990. Two noteworthy collections of Orobanche L. (Orobanchaceae) from Missouri. Missouriensis 11(1): 5-6. Smith, T. E. 1998. 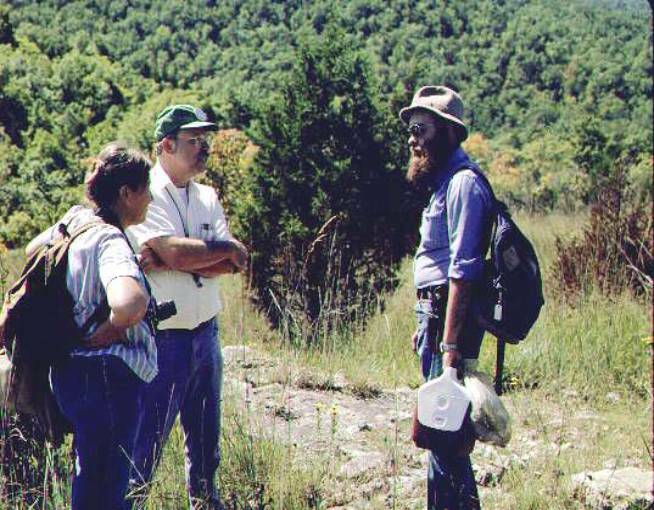 Highlights of Missouri field botany (1997-1998). Missouriensis 19: 54-58. _______. 2001. Highlights of Missouri field Botany. Missouriensis 22: 16-21. Solecki, M. K. 1983. Vascular plant communities and noteworthy taxa of Hawn State Park, Ste. Genevieve County, Missouri. Castanea 48: 50-55. Steyermark, J. A. 1963. Flora of Missouri. Iowa State University Press, Ames, IA. lxxxiii, 1725 pp. [+3 pp. erata, printings 2-6]. Stuckey, R. L., 1972. Taxonomy and distribution of the genus Rorippa (Cruciferae) in North America. Sida 4: 279-430. Sullivan, Fr. J. 1991. Another alien has landed: Evax prolifera in Missouri. Missouriensis 12(1): 1-3. Sullivan, J. M. 1995. Utricularia subulata in Missouri. Missouriensis 16(1): 39-41. Summers, B. 1997. Two new native plants in Missouri. Missouriensis 18: 15-20. ______, M. Skinner and G. Yatskievych. 1996. Dalea gattingeri, a cedar glade endemic new to Missouri. Missouriensis 17(1, 2): 4-9. _____. and G. Yatskievych. 1990. Aster macrophyllus L. (Asteraceae), a new record for Missouri. Missouriensis 11(2): 31-33. Thomas, R. D., P.S. Marx and D. Lawson. 1974. Two adder's-tongues new to Missouri. Amer. Fern J. 64: 119-120. Thompson, R. L. 1980. Woody vegetation and floristic affinities of Mingo Wilderness Area, a northern terminus of southern floodplain forest, Missouri. Castanea 45: 194-212. Thomson, P. M. 1977. Quercus x introgressa, a new hybrid oak. Rhodora 79: 453-464. Timme, S. L. 1997. Two new and interesting records for Missouri. Missouriensis 18: 21-23. Turner, J. 1984. Wild leeks in Missouri. Missouriensis 5(4): 132-133. Turner, J. and G. Yatskievych. 1992. County record vouchers for vascular plant species newly recorded for Missouri since 1963. Missouriensis 13(2): 1-26. Wagner, W. L. 1979. Hitch-hiker from the West. Missouriensis 1(3): 9-10. Ware, D. M. B. 1969. A revision of Valerianella in North America. Ph.D. dissertation, Vanderbilt Univ., Nashville, Tennessee. x, 249 pp. Webber, J. M. and P. W. Ball. 1984. The taxonomy of the Carex rosea group (section Phaestoglochin) in Canada. Canad. J. Bot. 62: 2058-2073. Wells, B. F. 1984. A revision of the genus Heuchera (Saxifragaceae) in eastern North America. Syst. Bot. Monogr. 3: 45-121. Whitley, J. R., B. Bassett, J. G. Gillard and R. A. Haefner . 1990. Water plants for Missouri Ponds. Missouri Department of Conservation, Jefferson City. Yatskievych, G. 1990. Studies in the flora of Missouri, II. Missouriensis 11(1): 2-6. _____. 1999. Steyermark's Flora of Missouri, Volume 1, Revised Edition. The Missouri Department of Conservation, Jefferson City. xii + 991 pp. _____. 1993. Studies in the flora of Missouri, IV. Missouriensis 14(1): 27-42. _____ and D. Figg. 1989. Studies in the flora of Missouri, I. New records of introduced taxa. Missouriensis 10(1): 16-19. _____ and B. Summers. 1991. Studies in the flora of Missouri, III. Missouriensis 12(1): 4-11. _____ and _____. 1993. Studies in the flora of Missouri, V. Missouriensis 14: 27-43. _____ and J. Turner. 1990. Catalogue of the Flora of Missouri. Monographs in Systematic Botany 37, Missouri Botanical Garden: xii + 345 pp. _____ and J. A. Raveill. 2001. Notes on the increasing proportion of non-native angiosperms in the Missouri flora with reports of three new genera for the state. Sida 19: 701-709. In addition to the literature cited, the following sources were used in recording post Steyermark (1963) records. Anderson, C. J. 1998. Treasures from the great northern Missouri desert. Missouriensis 19: 23-31. Castaner, D. and D. LaPlante. 1992. Plants of the Little Bean Marsh Wildlife Area, Platte County, Missouri. Missouriensis 13(2): 27-49. _____, R. Mullikin, J. L. Smith and T. Priesendorf. 1988. Vegetation of Knob Noster State Park II. Species list. Missouriensis 9(2): 34-57. Collett, A. J. 1987. The vascular flora of Bona Glade Natural Area, Dade County, Missouri. M.S. thesis. Missouri State University, Springfield, Missouri. viii, 116 pp. Hudson, S. 1994. Notes on Ophioglossum in Missouri. Missouriensis 15(2): 6-9. Mattheis, S. J. 1996. Land condition trend analysis plot inventory field methods, a natural resource inventory and forest community analysis, Camp Clark, Nevada, Missouri. M.S. thesis, Missouri State University, Springfield, Missouri. vi, 84 pp. McKenzie, P. M., T. Smith & C. T. Witsell. 2003. Carex conoidea (Cyperaceae) new to Arkansas and notes on its occurrence in Arkansas and Missouri. Sida 20: 1727-1730. Mlekush. K. E. 1999. The vascular flora of Camp Crowder, an Army National Guard Military Installation in Newton County, Missouri. M.S. thesis. Missouri State University, Springfield, Missouri. viii, 79 pp. Ozarks Regional Herbarium, Department of Biology, Missouri State University, Springfield, Missouri. Preisendorf, T, and D. Castaner. 1995. Plants of the Jamerson C. McCormach Conservation Area, Holt county, Missouri. Missouriensis 16(1): 10-38. Rebman, J. P. and W. R. Weber. 1988. Two woody taxa of noteworthy occurrence in southwest Missouri. Missouriensis 9(2): 58-61. Rowan, D. 1994. Rediscovery of Trifolium stoloniferum in Missouri. Missouriensis 15(2): 1-5. Ryan, J. 1992 . Menyanthes trifoliata rediscovered in Missouri. Missouriensis 15(1): 17-21. Sell, P. D. and F. H. Whitehead. 1964. Notes on the annual species of Cerastium in Europe. P. 14-24 in V. H. Heywood (editor), Flora Europea notulae systematicae ad floram Europaeam spectantes, no. 3. Feddes Repert. Spec. Nov. Regini, Veg. 69: 1-62. Smith, T. E. 1998. The reintroduction of running buffalo clover (Trifolium stoloniferum) in Missouri, 1989-1998. Missouriensis 19: 12-19. Skinner. M. K. 1998. Botanical survey of seven sites along the Jack's Fork river, Ozark National Scenic Riverways. M.S. Thesis. Missouri State University, Springfield, Missouri. vii, 99 pp. Tenaglia, D. and G. Yatskievych.2002. Thlaspi alliaceum (Brassicaceae), another non-native species new to Missouri. Missouriensis 23: 39-41. Wakeman, A. and A. P, McKenzie. 1996. Rediscovery of Oryzopsis racemosis (Poaceae) in Missouri. Missouriensis 17(1, 2): 16-23. Weber, W. R. and W. T. Corcoran. 1989. Missouri Botanical Record 10. Missouriensis 10(1): 24-35. _____ and _____. 1989. Missouri Botanical Record 11. Missouriensis 10(2): 54-77. _____ and _____. 1991. Missouri Botanical Record 12. Missouriensis 11(1): 17-29. _____ and _____. 1990. Missouri Botanical Record 13. Missouriensis 11(2): 51-61. _____ and _____. 1991. Missouri Botanical Record 14. Missouriensis 12(1): 21-29. _____ and _____. 1992. Missouri Botanical Record 15: Missouriensis 12(2): 53-70. _____ and D. Ladd. 1982. Missouri Botanical Record I. Missouriensis 4(1): 9-11. _____ and _____. 1982. Missouri Botanical Record. Missouriensis 4(2): 58-63. _____ and _____. 1983 . Missouri Botanical Record. Missouriensis 4(2): 95-98. _____ and J. Raveill. 1984. Missouri Botanical Record. Missouriensis 5(2): 68-89. _____ and _____. 1984. Missouri Botanical Record. Missouriensis 5(4): 142-156. _____ and _____. 1986. Missouri Botanical Record. Missouriensis 7(1): 23-38. _____, J. P. Rebman and W. T. Corcoran. 1987. Missouri Botanical Record. Missouriensis 8(1): 32-47. _____, _____ and _____. 1987. Missouri Botanical Record. Missouriensis 8(2): 84-88. _____, _____ and _____. 1988. Missouri Botanical Record. Missouriensis 9(2): 66-81. Yatskievych, G. and A. E. Bryant. 1994. The Polygonum aviculare in Missouri. Missouriensis 15(1): 22-44.